With the bounteous delivery of my weekly CSA basket, we get a lot of greens. So many greens that I quickly tire of sautéing them and spend a lot of time looking for new ways to use them (and, I confess, occasionally letting them go bad in my fridge. You’ve gotta use those things fast!). Add oil of your choice to a heated pan and toss in garlic and onion. Saute over medium heat until translucent, 2-3 min. Add chicken and stir fry until warmed through. Sprinkle with salt and pepper to taste. Add chard and cook until wilted, about 3-5 min. Toss with rice and serve. I happened to have some leftover bacon so I threw some in with the chicken/chard mixture, which gave it a really nice flavour. If I hadn’t had the bacon, I would have added a splash of balsamic vinegar to keep it from being too dry. It might even be good with some shredded cheddar or a light cream sauce. Any green would work in this recipe; you could also substitute white rice, brown rice, or quinoa. Serve with sliced raw veggies for an easy, filling meal. 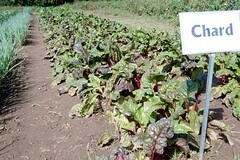 How do you like to serve chard and other greens?